Sasha Baron Cohen rose to fame with his man(dem) of the people interviewer Ali G, following up with the increasingly controversial Borat and Bruno, each of which spawned their own feature films. Cohen has returned with a new character, the charmless leader of a fictional North African state, Admiral General Aladeen, in 'The Dictator' - a comedy filled with crass humour, occasionally poignant political satire and dubious romantic subplot. For his latest feature film outing, Baron Cohen has once again teamed up with 'Borat' and 'Bruno' director Larry Charles. While those films embraced a mockumentary style, often based on improv with otherwise unassuming members of the public, 'The Dictator' treads more of a conventional path. Cohen's character of General Aladeen is a selfish misogynistic buffoon, proud of his anti-Semitism and his expertise in torture. His intentions to build nuclear weaponry causes the UN to vote for military action against his country of Wadiya. Aladeen decides to visit the US to address the UN Security Council but an attempt on his life finds himself having to live life as an ordinary man, aided by Zoey (Anna Faris). The plot is exceedingly flimsy and simply exists as a skeletal structure for the regular appearance of Baron Cohen's jokes, which veer between the unbelievably crass to the unexpectedly clever. Admittedly, 'The Dictator' very much specialises in the former, particularly at the expense of women. Nonetheless, this is firmly tongue-in-cheek material, outlined from the outset by the opening title screen - "In loving memory of Kim Jong-il". There is a clear nod to Charlie Chaplin's Hitler send-up 'The Great Dictator', not just in its title, but in an impassioned speech delivered by General Aladeen which draws links between democracy and dictatorships. The scene may not resonate quite as much as Chaplin's closing effort in 'The Great Dictator', which still largely bears true more than seventy years on, but nonetheless, it demonstrates a mildly intellectual basis for 'The Dictator'. Unfortunately, that speech is a rare example of (arguably) sophisticated humour in the film. The jokes are hit-and-miss but they do arrive with regularity, lending a breezy pace to 'The Dictator', while Baron Cohen triumphantly embodies his dictator, as expected from one of the finest comic actors of his generation. Yet the lack of engaging storyline and daft romance cripple the otherwise gleeful satire. 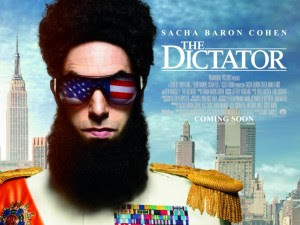 'The Dictator' is out in UK cinemas now.